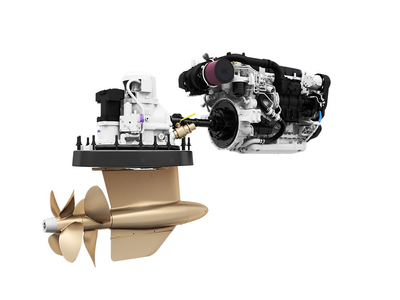 Cat Three60 Pod 650, designed specifically to match the Cat C8.7 electronically controlled marine propulsion engine. Cat pod propulsion gives you simple, precise 360° control with power to spare. It’s fast becoming the technology of choice for today’s fun-seeking yacht owners. A traditional propulsion system is made up of an engine, transmission, shaft, propellers and rudder — all individual components. Pod technology combines the transmission, propellers and rudder into a single component that takes up much less square footage. That means a smaller (and cleaner) engine room and more space you and your guests can use for sleeping, eating and relaxing on board. In a traditional system, some thrust gets wasted due to the angle of the shaft. That doesn’t happen with pod technology. Because the thrust is horizontal, 100 percent of it goes toward moving your yacht forward. The result? It takes less horsepower and less fuel to get up to speed. Even an experienced captain can find a shaft system challenging to operate in docking or slow-speed maneuvering situations — especially if the winds or currents are strong. That’s because the traditional system requires you to spin the steering wheel and control the throttle on both engines at the same time. With pod technology, you control it all with a single joystick. Just push, twist and go. Maybe you’re cruising an inland waterway and waiting for a drawbridge to raise. Or perhaps you’ve found a prime fishing spot in the open ocean. Holding position with a traditional shaft system requires that you either drop anchor or engage in some intense throttle and steering wheel effort. Pod solutions offer a “station-keeping” feature instead. All you need to do to maintain your GPS position and heading is hit a button. Cat Three60 Pod 650 is available for 35–60 ft. yachts.